The MASSFX MO tire was built with one thing in mind, fun. They're best suited for sport quads due to their dynamic tread pattern that can grip the terrain in any direction. They're perfect the the hard turns and fast straightaways that a sport quad is built for. This tread pattern also offers exceptional acceleration and traction on all surfaces. The 4-Ply construction offers durability without sacrificing a comfortable ride. The Max Load is pretty sturdy as well which is rated for 260 Lbs at 5 psi. With these tires, you can be "Doing Fun Right" too. 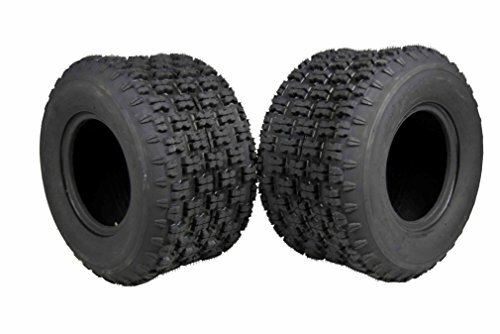 2 Pack 20x11-9 Rear MASSFX ATV Tire. Dynamic tread pattern offers exceptional handling and braking. Superior weight to performance ratio. Includes: Two 20x11-9 rear MASSFX ATV tire. If you have any questions about this product by MASSFX, contact us by completing and submitting the form below. If you are looking for a specif part number, please include it with your message.